Everything you need at Störsby is teamwork, relaxation and a good laugh! Teamwork and laughter are at good help at the activity track that is located in the Störsby forest. The Stockroom “Magasinet” is a nice place to spend the evening, and among nice people and good food it can never go wrong! Relaxation you get in the sauna, you can choose between the traditional sauna and the smoke sauna. 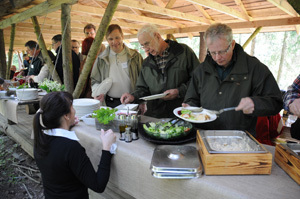 Food for groups under 30 persons and coffee services are prepared and served by Störsby’s hostess. The food is traditional Finnish cuisine. Food for groups over 30 persons are prepared by Ekström Catering. Ekström Catering is a family business who considers food to be a loving thing. With many years of experience Ekström prepares traditional Finnish cuisine as well as banquet dinners. Bea Malmberg is the activity leader at Störsby Yard. With her 18 years of experience as sport instructor. She has worked with both young children and seniors. She has worked with health- and rehabilitation exercises with both groups and single persons. With Bea you have the opportunity to learn new things about health and exercises by doing tasks and games. When needed Bea calls her help squad! We cooperate with other local instructors and we can even offer you massage service and other beauty treatments according to agreement.